Digital wireless multifunction printer is an ideal choice for the small business looking for a fast, reliable color all-in-one. Compact design is packed with big business features like a 3.7" color touch screen with Web Connect and wireless networking. 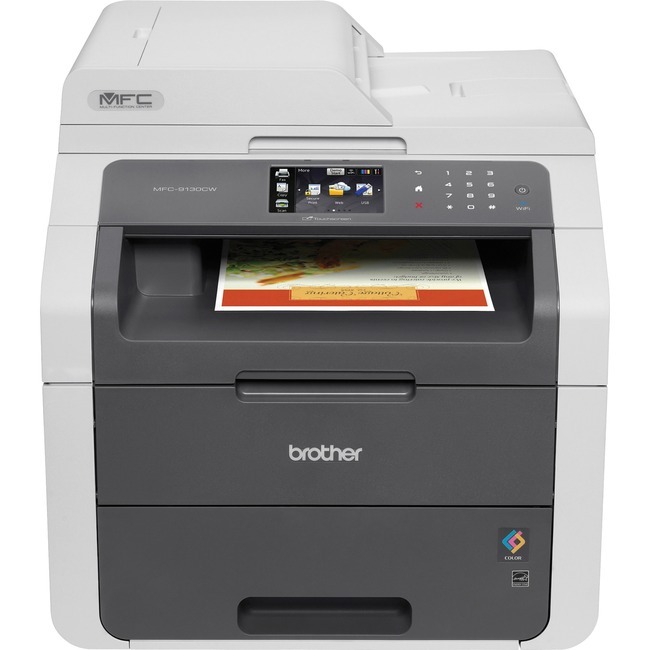 Print and copy high-impact color and crisp black documents at up to 19 pages per minute with up to 600 x 2400 dpi resolution as well as scan with up to 19200 x 19200 dpi and fax too. You can also wirelessly print from your mobile device via AirPrint, Google Cloud Print, Brother iPrint&Scan, Cortado Workplace and Wi-Fi Direct. Wireless networking is easy to install on your wireless network or print locally to a single computer via USB. Use the Secure Function Lock feature to set color page counts or restrict color printing for up to 25 users. MFC-9130CW printer also offers USB Direct Interface, 192MB memory, 33.6Kbps Super G3 Fax Modem, 35-page auto feeder and 250-sheet input tray. Energy Star qualified.